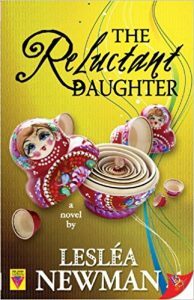 A story every daughter will recognize, The Reluctant Daughter depicts the struggles of Lydia Pinkowitz to communicate the realities of her life as a lesbian, as a feminist scholar, and as the woman she has become to her mother Doris. After years of hoping to attain her mother’s love and acceptance while struggling to live a true and honest life, Lydia eventually acknowledges her mother will never really see her. When Doris develops a life-threatening illness, Lydia is forced to make a life-and-death decision of her own: should she make one final attempt to heal her relationship with her mother or simply let her go? Read a review on Edutechnologic.com. Read a review in Curve Magazine. It took me half a century to find my mother. My mother wasn’t lost like the poor child whose sad face graces the poster hanging outside the convenience store that I pause to study every time I dash in to buy a carton of half-and-half for Allie’s morning coffee. Nor was she lost like the small gold Jewish star my parents gave me to wear around my neck when I turned sixteen which slid off its chain one day when I wasn’t looking and disappeared completely as an ice cube melted by the sun. No, I’ve always known exactly where my mother is: sitting in the living room of the split-level house I grew up in on Maple Drive, a quiet tree-lined street in Oakwood, New York, a suburb smack dab in the middle of Westchester County. I can locate my mother any time I want to, but that doesn’t matter. She is still missing in action. At least to me. My mother and I are so estranged, she doesn’t even know that we’re estranged. It’s not that we don’t communicate with one another. We speak on the phone once a month, sometimes once every other month, sometimes once a season. I am always the one to break the silence between us and dial my parents’ number, usually during a weekday when I know my father isn’t home. “You call your mother,” I say aloud. It’s a mean thing to say even if Allie is miles away at the lumberyard she manages and cannot possibly hear me. Allie would give anything to call her mother, but the woman died two decades ago, when Allie was barely twenty-seven. Allie is an only child and her mother was her only parent. They left Puerto Rico when Allie was five, first living in the Bronx with some friends they knew from the island, and then moving up to New England because Allie’s mother wanted her daughter to breathe fresh air, live among grass, trees and flowers, and be close to the sea. Allie says her mother loved her more than life itself, and she never felt like she was missing anything by not having a father, siblings, or any kind of extended family. Until her mother died, that is. After Allie lost her mother and before I came along, Allie was all alone in the world. And even though Allie is once again a part of a family of two, a family she and I have created, she still misses her mother terribly. Every year on November 11th, the anniversary of her mother’s death, Allie wakes up in tears, rises without a word and lights a pure white seven-day candle in her mother’s honor. Allie and I got together four years after her mother’s death and at that point, she couldn’t even mention her without breaking down completely. Things are better now, but still, Allie’s voice shakes and her eyes grow moist whenever she speaks of her mother. Call your mother. I stare down at the words, seething….